This dessert is a lemon-lover’s dream come true. It is also simple to prepare and perfect to end a substantial dinner, so keep it in mind as an option for your next dinner party. We served it after a delicious vegetarian lasagna (recipe coming soon). Whisk the egg yolks, egg, and sugar until blended. Whisk the lemon juice and reserve. Prepare an ice bath (large bowl or sink with cold water and ice cubes to keep the temperature very cold). Heat the oven to 300 F.
Combine the cream and lemon zest in a heavy-bottomed saucepan, heat until bubbles start showing on the edges of the pan. Remove from heat. Pour the cream while whisking constantly over the egg/lemon mixture, in a slow stream. Place the bowl on the ice bath and cool it, mixing gently. When it reaches room temperature, strain the cream through a fine sieve, discarding the lemon zest. Pour in 6 individual ramekins (5-ounce size). Place the ramekins in a baking dish, fill it halfway up with very hot water, cover the whole dish with aluminum foil, leaving a corner open. Bake for 35 minutes. Remove the foil, and gently jiggle one of the custards – if it’s set on the edges but still wavy at the center, remove from the oven, take them out of the baking dish, cover and refrigerate for at least 2 hours before serving. When it’s time to serve, place some pomegranate seeds over the custard, sprinkle a little powdered sugar, and…. Comments: My only modification to the recipe was the addition of pomegranate seeds, and they were a hit, providing a nice contrast of color and texture to the creamy custards. Because pomegranate can be a bit tart, I sprinkled a light coating of powdered sugar just before serving. Note to self: Make these custards again soon. Very soon. olá! but that delight! this prescription, seems wonderful, goes to make, counts later you. caroliny! I love a lemon dessert. 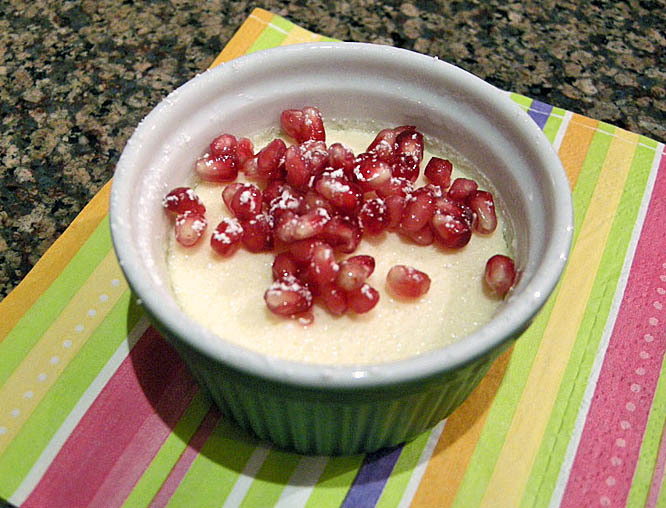 And, the pomegranate seeds look great with the custards! Can’t wait to see the lasagna next. Lovely and lemony! I’ve only just discovered pomegranates, and was instantly hooked! Looks so good with the pomegranate. It makes me think if the Thai dessert with ice shavings in coconut milk and water chestnuts in tapioca flour, plus pandan leaves for extra flavor.